Look good and do something good: with buying this bracelet, you will support the charity organization named "STRONG against CANCER" from the German society "Wattikan". With every sold bracelet, the net profit goes to the society. The proceeds will among others fund the cancer information centers in the "Westküstenkliniken" and the information days about cancer in Brunsbüttel. 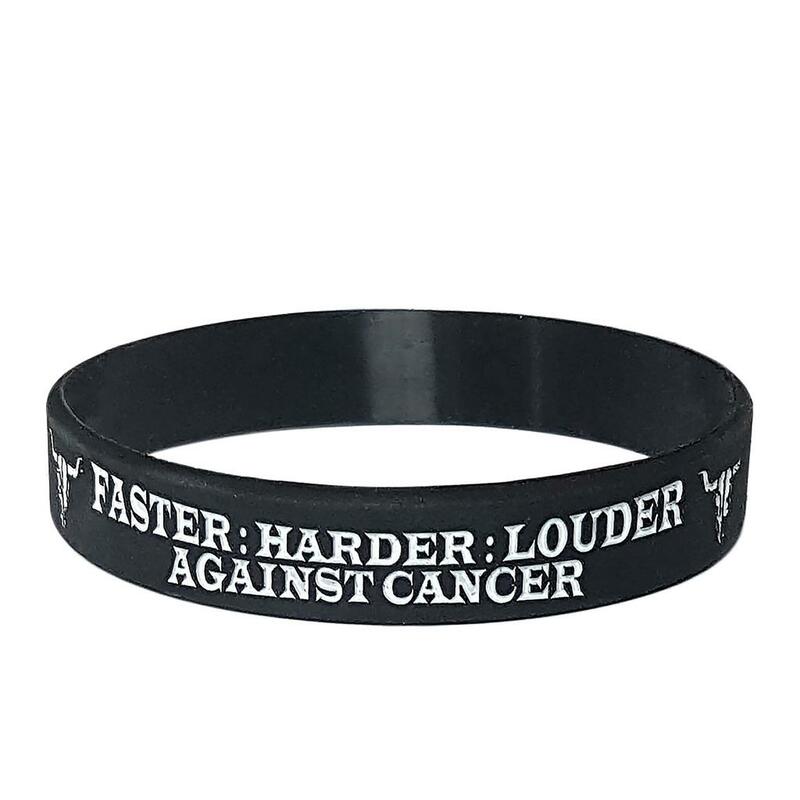 The black silicone bracelet is imprinted with the slogan "Faster, Harder, Louder - Against Cancer", which is flanked on both sides by the famous W:O:A bullhead. Based on the campaign STRONG against CANCER, where the heads from the successfully charity-event “Wattolümpiade” developed strong and new structures for cancer affected persons in the North German west-coast, arose the initiative STRONG against CANCER at the Wacken Open Air 2018. Holger Hübner, Thomas Jensen and Jens Rusch initiated a solidary-campaign where plain black bracelets with the lettering “Faster:Harder:Louder against Cancer” play an intermediary role. Numerous stars from the metal-scene are showing their solidarity with this powerful movement with their bracelets. HERE are some examples. The word “compassion” is based on the willingness “to suffer with”. Our language is often very pictorial. But we lack a pictorial signal for abstract terms like capability for empathy or solidarity. In some way, this plain bracelet becomes a human gesture, a complete personal manifest. A signal to affected friends, a lovely memory to somebody, who lost the fight against cancer, but also a hint with own concern on the will to survive. Everyone can help. Just afford a bracelet for 5.-€. The net income goes to the useful work of the campaign STRONG against CANCER and the cancer consulting centre west-coast of the Schleswig-Holsteinischen cancer society. net profit goes to the society "Wattikan"
LAUTSTARKgegenKrebs from Jörg Reichert on Vimeo.